Things have been quiet around here as I get ready for some major life changes. I've been without my kitchen for a while so even though I desperately needed to make something, anything for my sanity, I couldn't. I also really missed participating in the various groups. I had access to a kitchen yesterday so I quickly kneaded this bread for the last Crazy Ingredients Challenge of 2015. It's weird to think that 2015 is over. Anyway, our challenge ingredients this month were cocoa and cranberries. It's not a difficult combination - nothing crazy about it at all. But with all the busyness of the season, I guess it's good to have one less thing to spend a lot of time worrying about. I adapted this bread from a Cocoa-Nut Swirl Bread in a cookbook called Chocolate Fantasies. Hope the holidays are treating you well. Be sure to visit the other blogs to see what they made. Combine all the dough ingredients and knead until you have a soft dough. You may need to add more flour. You could also use a little less milk. Keep kneading until it's smooth and elastic. Place in a greased bowl and let rise until doubled. After the dough has doubled, turn out onto a floured surface. Roll out to a 15" x 7" rectangle. Brush it lightly with water. Combine the sugar and cocoa then add just enough milk to form a smooth paste. Spread evenly over the rectangle then sprinkle with chopped cranberries. Starting at the short end, roll up the dough, seal and fold the ends under. Place in a greased 9" x 5" loaf pan. Cover and let rise until doubled. Bake at 375℉ for 35 minutes or until the loaf sounds hollow when tapped. Transfer to a wire rack to cool. Loaf may be glazed if desired. I just woke up from a dream about Stacy from Food Lust People Love/ . I can't remember the details of the dream but I think we were travelling. The details really don't matter though; it was just my subconscious’s way of trying to wake me up to write this post. I've been really excited about baking and sharing this basket for a while but I was completely blank about what to write here. Had I remembered the details of the dream, I'd certainly have some material. Let's ramble about the basket then. It took a while! Clear some time in your schedule if you're a slowpoke like me. Part of that is because I was figuring out things as I went along. 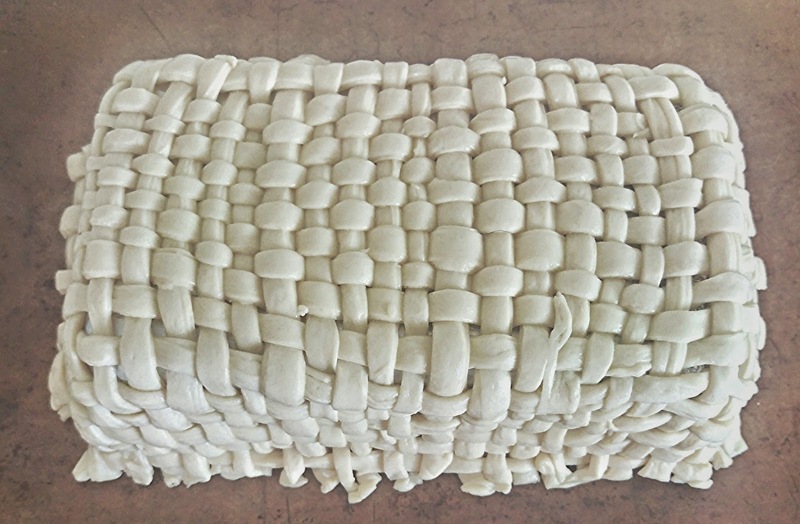 I switched from weaving the dough on the form to weaving it on a baking mat. I found that I preferred to work with chilled strips and I kept worrying about my dough proofing before I was finished so there were several trips to the refrigerator. Then I got really hungry. It actually took me half hour to properly roll ropes that would be twisted and form the top edges of the basket. The ropes just would not corporate! And when I got it done and was ready to bake it, I realised that I didn't mind the edges of the basket. Had I initially planned to leave them bare, I would have trimmed it better. But I was happy enough. That twisted rope then became one of the pieces you see in the basket with the rolls. I ate it first. You can see that my strips were not all the same width and my basket weaving needs some work. But I am still really happy about how it turned out. I can't wait to do this again and serve it to friends. I actually have some ideas for fun variations. Thanks, Pavani for choosing the theme this month. This basket had been on my mind all year and I am glad that I finally got to do it. Be sure to scroll down to see all the other breads this month. Combine all the dough ingredients and knead until gluten is fully developed. If dough seems dry, add a teaspoon of water at a time. It's a firm dough and should not be sticky.Place in an oiled container, cover and let rise until doubled. Dough can be bulk fermented in the refrigerator. Cover an inverted 9” x 5” loaf tin with foil. Thoroughly grease the foil. Gently deflate the risen dough. Working with small pieces at a time, roll out a ¼ inch thick rectangle that is long enough to drape over the inverted loaf tin. Cut out ¼ inch strips. Start weaving these strips on a flat surface. 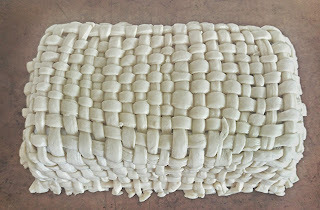 Keep dough that you're not currently using in the refrigerator.Keep weaving until you have a mat that is large enough to drape over your inverted loaf tin. Depending on the height of your loaf tin, this mat may be about 15 inches by 11 inches. Drape over the tin and trim the edges.Place on a baking sheet and brush with an egg beaten with a tablespoon of water. Bake for 30 minutes then check to see how well it's browning. If it's not yet golden, return to oven until golden. Remove from oven and carefully invert and remove the loaf tin and the foil. Return the basket now right side up to the oven for a few minutes so that the inside can be properly cooked. It won't get much colour but you're looking for a temperature around 190 F. I kept mine in for about 10 minutes. Cool on a wire rack then fill with your favourite rolls and breadsticks. It took me more than an hour to do all the cutting of the strips and weaving. But I'm really slow on the kitchen so it may go faster for you. You can wait until you have about thirty minutes of work left to preheat the oven. You could weave the strips on the mold. I started out that way but working on the sides was really difficult (strips kept slipping) for me so I switched to doing it all on a flat surface. It's occurring to me now that longer strips that went all the way around the sides may have made it less difficult. Next time I'd use wider strips so that the weaving went more quickly.I chose to leave the edges unfinished but you can make a twisted or plaited rope for the top of the basket. You should already know that I am not sold on having muffins for breakfast. It’s a cultural thing; we emphasize savory breakfasts. In fact, our favourites are very salty. Serving muffins and pastries would garner several frowns. I know my mother does when she’s offered Danishes for breakfast. Now with the addition of rum to these muffins, I think I am basically screaming, “These are not for breakfast!” But if you eat them at 10 am like I did, I am certainly in no position to judge. If you’re worried about being judged, keep the presence of rum a secret and simply smile widely while you enjoy these muffins in that really boring morning meeting. I have an acquaintance who would tip a bit of white rum into her morning coffee. 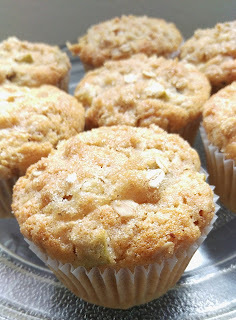 I think these may be my favourite muffins to date. It might be the booze talking since I am obsessed with alcohol in baked goods. Though these are whole wheat, they are extremely moist and flavorful (that’s definitely the rum and oh yeah, the cinnamon). If rum is not your thing, soak the raisins in some water. Hot water will hydrate them pretty quickly and you’ll be ready to bake without an overnight wait added in. 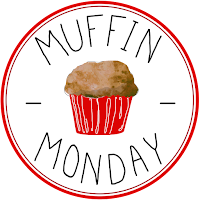 Be sure to scroll down to see all the other delicious muffins this month! Soak the raisins overnight in enough rum to just cover to them. Preheat oven to 425 F. Line a muffin pan with liners or grease the wells. Mix together the ¼ cup sugar, flour, oats, and cinnamon. Drizzle over the melted butter and toss together until all the dry ingredients are moist. Set aside. In a large bowl whisk together flour, baking powder, cinnamon, and salt. In a separate container mix together sugar, milk, oil, and the egg. Add the wet ingredients to the dry ingredients and stir until just combined. Stir it no more than ten times. Fold in the chopped apple and drained raisins. Distribute the batter among the muffin wells filling all the way to the top. 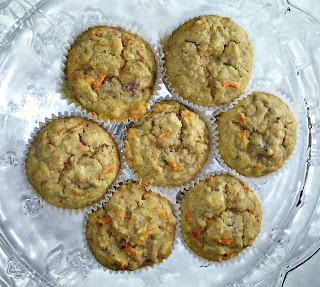 Sprinkle each muffin with the oat mixture that you side aside earlier. Bake for 5 minutes then lower the oven temperature to 375F. Bake for another 15 minutes or until a toothpick inserted into the muffin comes out clean. Cool for a few minutes in the muffin pan then remove and cool on a wire rack. Why waste that lovely rum? Reduce the milk and add the rum that you soaked the raisins in to the batter. Or use in your next microwave mug cake. Welcome to another Crazy Ingredient Challenge! This month the winning ingredients were apples and chives. 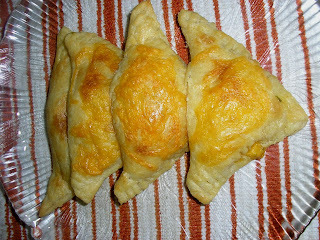 My first idea was to make some apple, cheese, and chives scones but at some point that turned into turnovers. No regrets here! I got to practise making a blitz pastry dough - it’s really easy and really flaky. It’s faster than traditional puff pastry and quite delicious. I still have scones on the mind though so maybe later this week I’ll make those and post them. Sorry about the super quick post. It’s only 7 am but it’s already shaping up to be one of those days. Be sure to scroll down to see how my fellow Crazy Ingredient Challengers used apples and chives this month. Sure to be mouthwatering! Whisk together the dry ingredients then cut the butter into the flour mixture. You can use a food processor. Leave mixture unevenly crumbly. The largest pieces of butter should be about the size of a pea. Stir in the sour cream. Turn the dough out onto a well floured surface and pat it into a rough square. It’s OK if it’s a bit shaggy. Roll out into an 8” x 10” rectangle. Dust the dough with flour, if necessary. Starting with a shorter end, fold the dough into thirds as one would a business letter. Turn it over so that the open end is on the bottom. Once again, roll the dough out into an 8” x 10” rectangle and do another letter fold. Turn it over so the open end is on the bottom, roll out again to 8” x 10” and do a third letter fold. If the dough is sticking, chill it before doing the third letter fold. After the third letter fold, wrap in plastic and chill for at least 30 minutes before using. While the dough is chilling, dice the apple into small pieces, shred the cheese and chop the chives. When the dough is ready, preheat the oven to 400F. Roll out the chilled dough to a 16” square and cut into 16 4” squares. 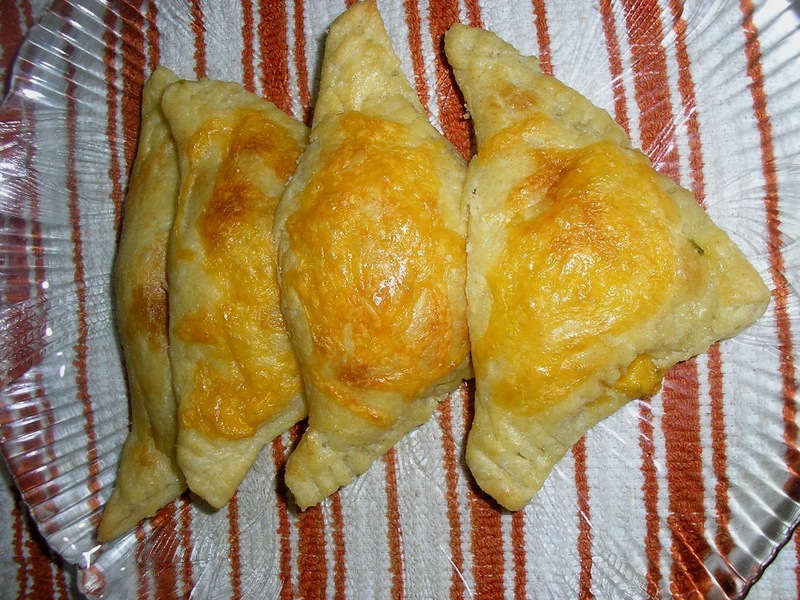 Place a bit of apple, cheese, and chives on each square. Be careful not to add too much - should be no more than a tablespoon or so of filling. Fold over each square and use a fork to the crimp and seal the edges. Place the turnovers on a lined baking sheet and brush with egg wash (1 egg mixed with 1 tablespoon of water). Sprinkle on any remaining cheese. 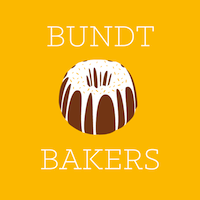 This month, the Bundt Bakers are making cakes based on their favorite beverages. On a daily basis, I pretty much only drink water. But my friends had no suggestions for a "water cake".A boozy cake would have been great as I love baking cakes based on cocktails. However, the truth is that I only drink alcohol about once a year. On those occasions, I'll choose a drink that someone else loves (screwdriver) or I'll go for a strawberry daiquiri. Daiquiris are delicious and remind me of hanging out at Flanigans in Miami. But still, I wouldn't call it a favourite. Since I really don't have favourites, I really wanted to create something that had some really special meaning to me. I was a greedy baby. If I saw food, I ate it - even if it wasn't meant for me. My mother likes to tell the story of her taking a mango from someone to pass to someone else. I was sitting in her lap and as the mango passed by, I lunged out and took a bite. I was definitely not a picky eater. I like to think that I was helping her out. She had her hands full with my brother who barely ate. One of the things that I loved was porridge. I'm not sure if there is a particular kind that I loved but oatmeal, cornmeal, and banana are among the more common types in Jamaica so I suspect it was one of those. My mother would make a large batch for me each day and I would happily finish it. One week she was particularly busy and our helper (what we call a housekeeper/nanny) had to make porridge. No one knows what really happened during that week. But I suspect we had a bit of a Little Albert situation on our hands. Did the helper burn me? Were her porridge making skills just not up to par? We don't know. But what we do know is that I never drank porridge or milk or milky drinks ever again. My mother said I would scream and cry if she brought it near me. To this day, I still shudder if I'm near porridge. I paused my milky drinks embargo when I was 4. Suddenly I developed a craving for Milo but only at 2 am. Every night I would wake my mother up asking for Milo. My poor mother would get up, make me Milo and then shuffle back to bed. Understandably, this started to take a toll on her. Eventually she started telling me to go back to sleep and she'd bring my Milo to me. Lies! I'd wake up each morning Milo-less. I'd complain but it didn't help. Soon, I stopped asking. Mummy: 1. Kelly: 0. It's been decades since I've had a cup of Milo sweetened with condensed milk. (Condensed milk goes into everything in Jamaica - Milo, coffee, porridge, fruit, spoons.) But I do look back at that period and smile. I laugh actually - laugh at my mother tricking me into going back to sleep. I wasn't hungry and she knew this. Her getting her much needed rest was definitely more important. Fun Fact: I wrote all of the above back in July. I was on the phone with my mother while writing and sure enough, she brought up the Milo incident. Forever reading my mind! We weren't even talking about food so I have no idea what primed her. I need a foil hat. Also, I wrote all of that assuming that everyone knew what Milo is. Milo is a chocolate flavoured malt beverage from Australia. It's similar to Ovaltine and Horlicks. Enjoy all of the other Bundts below! Preheat oven to 350 F. Thoroughly grease and flour a Bundt pan. I used a 10 cup pan. Whisk milk, eggs, and vanilla together in a small bowl. Add flour, Milo, baking powder, and salt to a mixer bowl. Mix until combined then add butter one tablespoon at a time, mixing until only small pieces of butter remain. Add half of the egg mixture and increase the speed and beat for a minute or until light and fluffy. Reduce the speed and add the remaining egg mixture. Increase the speed again and beat for 30 seconds or until incorporated. Pour the batter into the prepared Bundt pan. Bake 50-55 minutes or until a toothpick inserted comes out clean. Cool in pan for 10 minutes then invert onto a wire rack to cool completely. For the glaze, beat together butter and sugar then add enough condensed milk to reach your desired consistency. Pour over cooled cake. I have been neglecting my sourdough starter.There was a time when we'd have weekly dates but weekly dates have turned into a lacklustre monthly appointments where the starter is hardly the star of the show. I kept promising that I'd do better but just never did. I got sucked in by the speed of commercial yeast and it's been hard to tear myself away. 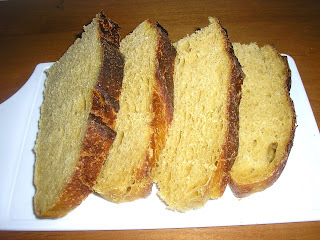 As I was flipping through some cookbooks trying to figure out ways other than curry pumpkin to use some leftover pumpkin, I saw a recipe for a pumpkin sourdough loaf. Perfect, really, as the theme of this month's Bread Bakers is fall flavours. I am always so worried whenever I decide to use my starter. After several years of growing the little fellow, you think I'd have a bit more confidence in its abilities. Alas, I am the nervous kind so I am always crossing fingers and toes and praying that it doesn't decide to repay me for my neglect by failing to rise and leaving me with bricks. Didn't happen this time! The recipe is adapted from Teresa Greenway's Discovering Sourdough. I used less liquid but more pumpkin plus added some milk powder instead of using milk. The dough is a just a tiny bit sticky but the hydration is lower than the original recipe and so a bit easier to work with. Mix together all the preferment ingredients and let sit at room temperature for 4-6 hours. Refrigerate overnight. Remove the preferment from the refrigerator and add the pumpkin, oil, brown sugar, and milk powder. Next knead in the flour for about a minute. Let rest for 20 minutes then add the salt. Knead for 4 minutes the let bulk ferment for 4 hours giving the dough a stretch and fold once per hour. On a floured surface, shape the dough then place into a floured banneton or bowl to proof. 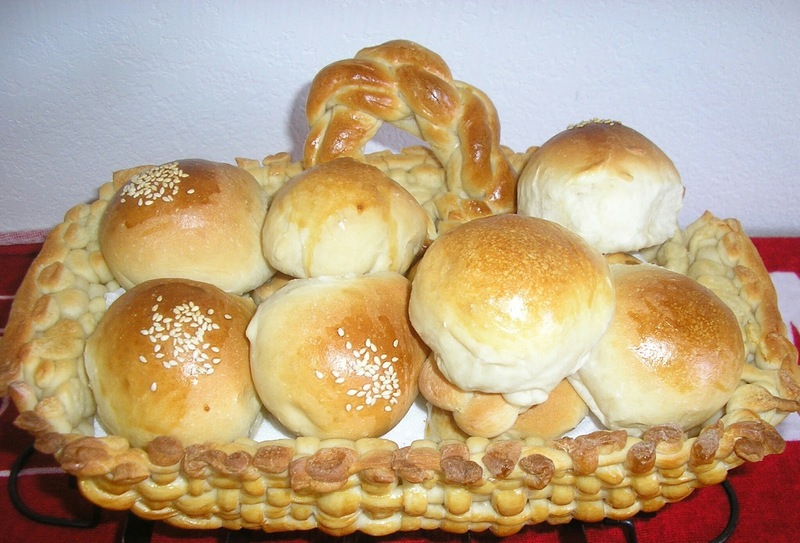 Let rise until doubled and puffy (about 1 to 2 hours depending on your starter and the temperature of your room). 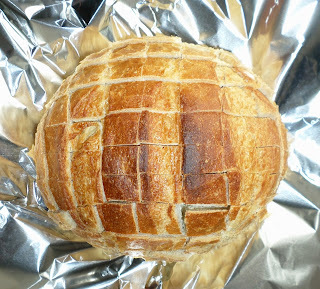 While the dough is rising, preheat a dutch oven or cloche in a 450 F oven. You could also use a baking stone and a roasting pan that can be inverted over the stone. When the dough is ready, slash the dough and place in the dutch oven, cloche or on the baking stone. Sprtiz with water, cover and carefully place in then oven. Bake for 20 minutes then remove the cover and lower the oven temperature to 400 F. Bake for another 15 to 20 minutes or until the dough registers about 200 F.
You can add your favourite spices and/or dried fruit during hte shaping period. 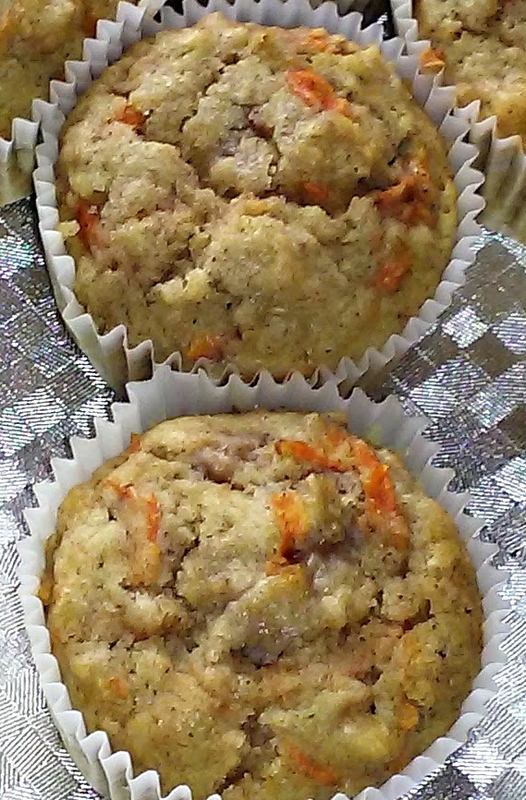 Let's take a look at the other Fall Flavors being shared today Thanks for hosting, Wendy! One day last week I hungry but didn't have time to go get a proper meal so I decided to grab something from a vending machine. I used to have a daily vending machine habit. I'd get one of two things - a cinnamon roll or a honey bun. Hey, stop judging me. I know the vending machine varieties taste nothing like ones from a bakery or homemade but this was an essential daily fix. As I approached the vending machine that evening, I thought about getting a cinnamon roll. But I was really hungry and even though there are a million calories in those rolls, I am inevitably hungry seconds after eating one. I spotted bagel with cream cheese and thought that was perfect. But right beside the bagel was an Otis Spunkmeyer blueberry muffin. And beside that? Chocolate chocolate chip muffin. The chocoholic in me danced. My friends and I have this thing where we keep each other accountable by logging our meals and fitness activities on MyFitnessPal. Sometimes we'll send out messages if we're being tempted by a treat. Truth be told, they do this. I just respond to the messages. My temptations are never "Should I have ice cream today?" but "Should I eat another ice cream bar and a slice of cake?" I just pretend that I am being good and leave the extras off MFP. I thought I'd have them weigh in on this one though because I was seriously torn. I was about to hit send when I realised that if they didn't choose the muffin, I'd be really sad. Decision made. I got the muffin. Oh happy day! 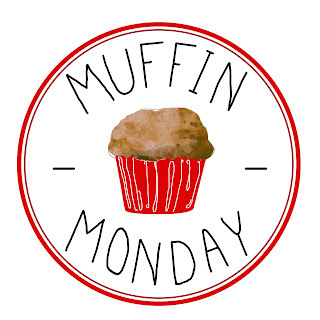 That muffin was 720 calories of pure bliss. I grinned from ear to ear as I ate every crumb. It's like I had forgotten just how amazing choxolate + chocolate chip was. 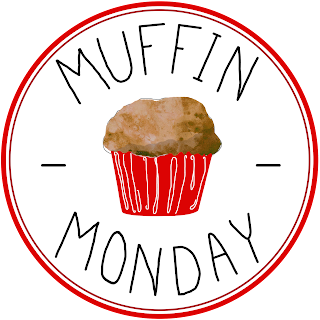 Had I not already made my Muffin Monday muffins, I would have definitely ran home to mix some up. Five minutes after the muffin, I was hungry again. But I was still happy. 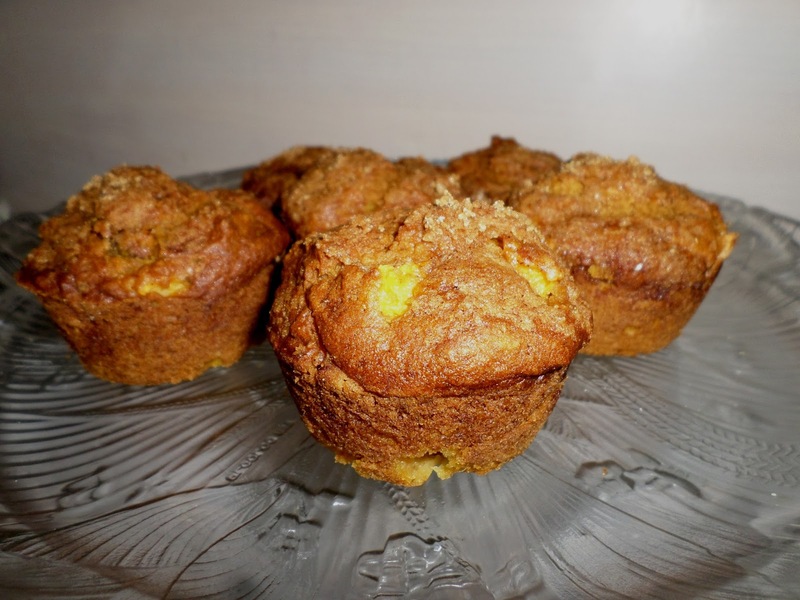 These peach and pumpkin muffins are no chocolate chocolate chip muffin but they are still rather delicious. Peaches are almost out of the supermarket so I thought I'd grab some and combine them with the pumpkins that are overflowing the supermarket bins. 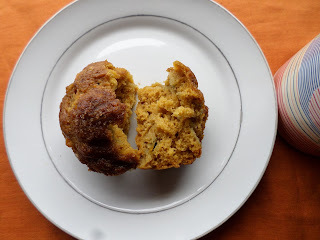 It was still a little hard for me to think of pumpkin in a non-savoury light but these muffins have definitely changed my mind. Preheat oven to 350 F. Line or grease a standard muffin pan. Divide the batter among the muffin wells. Mix together the brown sugar and cinnamon and sprinkle over the tops of each muffin. 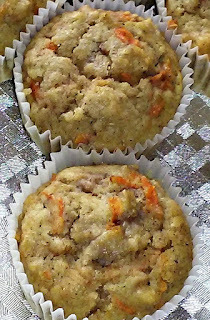 Bake for 25-30 minutes or until a toothpick inserted into the muffin comes out clean. Change the spices to suit your taste. I stood in the kitchen and stared hesitantly at the goat cheese. I needed to taste it but I was afraid. I am no stranger to goat. In Jamaica, curry goat is a favourite. No respectable celebration leaves curry goat off the menu. A dead yard (wake) isn’t a dead yard if there is no mannish water - a goat soup that’s thought to be an aphrodisiac -served. Still, I was a bit worried about this cheese. I knew it would be pungent/gamey. Too pungent for me to like it? I really wasn’t sure. But I had to taste it. I took a breath, opened the package, and reached for a knife. I wasn’t expecting it to be that creamy - pretty much like cream cheese. I assume there are hard varieties available but this was the only one my supermarket had. I closed my eyes and took a taste. Oh. I was being dramatic for nothing. This particular brand was very very mild. The gamey goat taste was there but certainly not strong enough for me to turn away. It was nothing compared to a cup of mannish water. I could definitely handle this. Goat cheese and mushrooms won the Crazy Ingredient Challenge this month. I had a really fun pastry planned but a friend sent me a picture of bloomin’ bread/pull apart bread/party bread (what do you call it?) and I completely changed my mind. Zero regrets. The bread is absolutely delicious! The goat cheese isn’t a gooey melter like a mozzarella but it still worked well here. I am guessing that it would be pretty difficult to mess this up. The most difficult part is slicing the bread. I used a relatively freshly baked Italian loaf and the crumb was really soft. Next time I will bake a loaf with a firmer crumb. That would make not only slicing easier but when it’s time to pull out pieces of bread, they would also come out more easily. Place the minced garlic and a tablespoon of butter and a teaspoon of water in a pan over low heat. Cook stirring occasionally until the garlic is straw coloured. While the garlic is cooking, prepare the bread. Make one inch slices being careful not to cut all the way to the bottom. Turn the loaf and make one inch slices at 90 degrees to the first slices. When the garlic is ready, add the remaining butter to the pan and stir until butter has melted. Pour off the garlic and butter into a bowl. Remove a tablespoon of the garlic butter and return to the pan to cook the mushrooms. Add the red pepper flakes to the reserved garlic butter and let it sit while you prepare the mushrooms. Add the mushrooms and a pinch of salt to the pan and stir frequently until the mushrooms begin to release moisture. Cook for another 3- 4 minutes then remove from the heat. 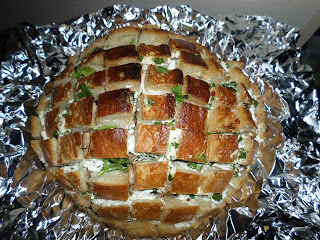 Mix together the goat cheese and the cilantro. Place the sliced loaf on a sheet of foil on a baking sheet. 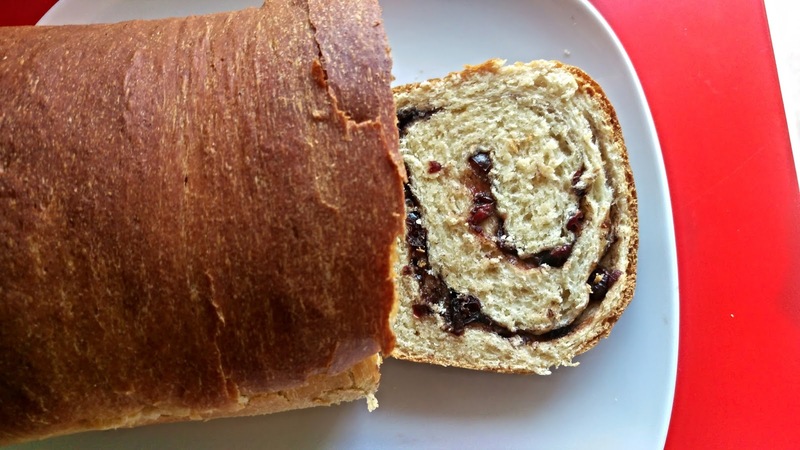 The sheet should be large enough to wrap around the entire loaf or you could use a second sheet to cover it. 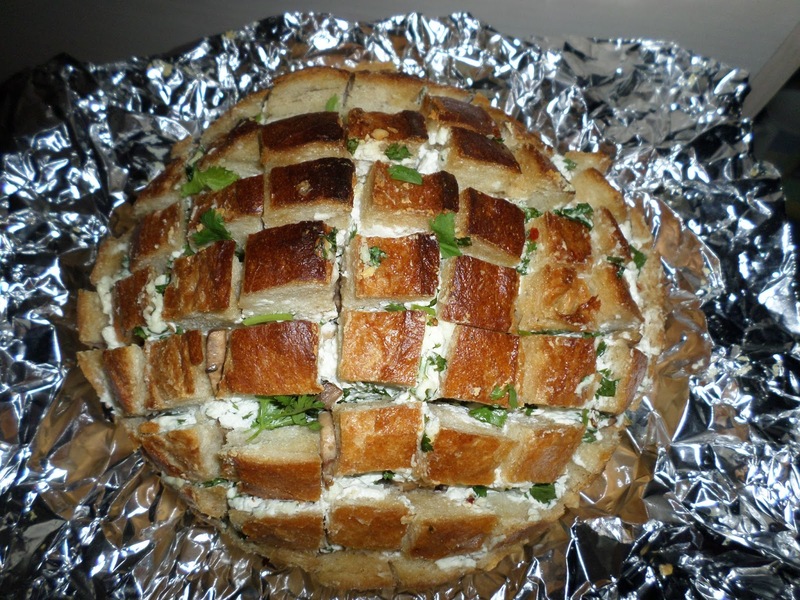 Pour the garlic (+ pepper) butter evenly between the slices of the bread. I used a spoon for this step. Stuff the mushrooms evenly between the slices then follow with the goat cheese. Cover the loaf in foil and bake for 15 minutes. Remove the foil then bake for another 10 minutes or until the cheese is completely heated through and the edges are toasted. Pulling the "fingers" apart will allow the bread to toast more quickly. The goat cheese I used isn't a melter. Feel free to throw in your favourite melting cheese. "Never toast marshmallows on an unlined cookie sheet." That was my social media status on Sunday while I worked on these little Bundts. My little marshmallow incident reminded me of another incident from my childhood. I'm not sure how old I was but I should probably say a really young age so that I look better in this story. Let's go with 10 years old. There's a cooking show on Jamaican television called Creative Cooking. While I prepared lunch or a snack, I would fancy myself on Creative Cooking and talk to my imaginary audience. One evening, Creative Cooking featured candy making. I was intrigued. I don't think I had ever attempted anything from the show before and my kitchen skills were pretty limited - I could boil hot dogs and make seasoned rice. But candy needed to be made. I gathered pots and spoons and then went out to the lime tree to get some limes. I'm not sure how the limes fit in. I don't think they were part of the recipe. Maybe I wanted them to be lime flavoured? Or maybe I have conflated some memories? It's been a while. Anyway, the sugar started melting and I started stirring. I should also point out that I had not written anything down from the show. It was all from memory. At some point, things started going very wrong. I no longer had pretty melted sugar on my hands, I now had smoking melted sugar. Oh and the spoon that I was using had started to melt also. I panicked. Soon I had sugar stuck in the pot and on multiple spoons. I knew my mother would be home soon and she would probably kill me. So I grabbed the pot and spoons and tossed them into the back of the cupboard. Don't give me that look! I was TEN! I think. I didn't have a plan so the pot and spoons just sat there. Months passed and I had forgotten about the candy making disaster. I don't know if my mother had ever asked about the pot. She must have though and I'm pretty sure I lied. "The small pot? What small pot? That I use for hot dogs? Oh look! A fly. Let me get rid of it." Or perhaps, "Hmm. You're right. I haven't seen it in a while." Well, that would have been the truth. I couldn't see it hidden there in the back of the cupboard. My luck eventually ran out (as it always did) and one day Mummy found the pot. Look, I am going to be honest. I do not remember much about "Discovery Day" but she spared my life so there's that. As I type this, my mother is actually on the phone with me. And funnily enough, she is complaining about a cast iron pot that my brother messed up. I'd ask her about "Discovery Day" but I see no reason to get her started on me. Ha! She's now talking about a spoon. It's like she knows what I'm typing over here. She has always been oddly "psychic" like that. While I was making notes for a blog post for next month, she randomly brought up the incident I was writing about. Time to distract her because I think she's heading down the "kitchen stuff my children have damaged" path. Let's get back to 2015. The task for this month's Bundt Bakers is to create a s'mores cake. Confession: I've never had s'mores but I made s'mores brownies once. They were pretty amazing but I had carrot cake on the brain so a chocolate cake wouldn't do. I thought I'd make a carrot cake that had graham crackers and white chocolate chips and then top it with a toasted marshmallow glaze. I got my marshmallows toasted but didn't move quickly enough to get them all off my unlined/ungreased cookie sheet. The toasted marshmallow glaze was delicious but way too chunky to be used in the way I pictured it. And on top of that, I now had marshmallows stuck to my cookie sheet and spatula. Thankfully, Adult Kelly knows a bit more chemistry than 10 year old Failed Candy Maker Kelly. I boiled some water and poured it over my cookie sheet and spatula. Disaster averted. Toasted marshmallow glaze will have to wait though. I decided to stick with just a regular marshmallow glaze. In the middle of the night, I had the bright idea to top a mini Bundt with marshmallows and then toast the tops. Tasty. I didn't take pics though. Preheat oven to 350 F. Grease a nine 1 cup capacity mini Bundt pans. Whisk together the dry ingredients. Then whisk together the sugars, oil and eggs in a separate bowl. Pour the wet ingredients into the dry then stir until just combined. Fold in the carrots and chocolate chips. Divide among the mini Bundt pans. Bake 15 - 18 minutes or until a toothpick inserted into the mini cakes comes out clean. Place the confectioner's sugar, vanilla and salt in a bowl. Over medium heat, melt the butter in the water then stir in the marshmallows until melted. Pour the marshmallow mixture into the sugar mixture. Mix until combined and use immediately. 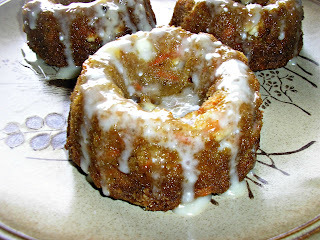 There's a lot of carrot in these cakes so they are extremely moist. Handle with care. After cooling for a few minutes, I loosened the edges with a spatula then placed the mini Bundts in the freezer. That made them really easy to unmold without fear of the cakes breaking. The glaze goes on thick but dissolves into the cake pretty quickly. . Here are all the S'mores themed Bundts. Thanks for hosting, Lauren! As I sit here, it's raining heavily outside. It's been like this for the last few days - five minutes of sunshine and then heavy rain for the rest of the day. It's annoying when one has errands to run, yard work to do, and pictures to take. But the rains are desperately needed. The state had been experiencing a bit of a drought - nothing like California and Jamaica though. I wish that I could send them some of this rain. I also have to be grateful that it's just heavy rains and not the hurricane that we were looking out for last week. It's been years since I've had to do hurricane preparations. I actually had to google what was needed. Sure, I needed water but how many gallons per day was it again? In typical South Florida style, water was flying off the shelves faster than the workers could restock it. Bread was also a scarce commodity. I haven't bought bread in over three years and I couldn't decide whether I should get some or not. I had already planned to make a potato bread for this month's Bread Baker's whole grains theme. But was homemade bread a good idea for my hurricane food supply? Homemade bread doesn't have preservatives and would only last so long. Baking multiple loaves was probably not a good idea. Some sourdough loaves tend to have a little bit more staying power but I wasn't in the mood to wake my starter up. Plus, it probably would not have made a huge difference. Luckily, the storm fizzled and died so I could bake my bread without worrying about how long it would last in my hurricane survival kit. 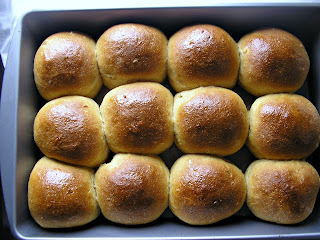 Let me tell you, it was great to enjoy these rolls without needing to think about post-disaster survival. These rolls are delicious. You know when you make something so good that when you take that first bite, you immediately propose to yourself? These were that good. (What? You don't propose to yourself? Odd.) I picked up the phone to text a friend about the rolls - intending to send her some. Luckily, I realised that would mean fewer rolls for me and put the phone down. Sorry, friend. I can't take any credit for the recipe. I just took King Arthur's recipe and substituted whole wheat flour (whole white wheat actually). 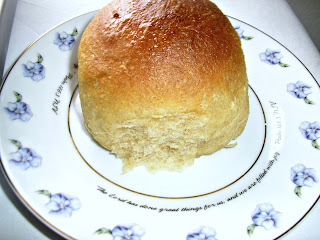 I worried that I wouldn't have amazing fluffy rolls since I did a direct one to one substitution. But one should never doubt the power of potato. 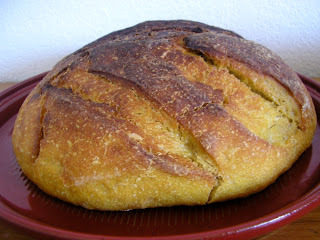 Potato is an amazing dough conditioner and certainly worked wonders here. You'd never guess that it's completely whole wheat. It also helped that I used white wheat instead of red wheat - a very different flavour profile. Traditional red whole wheat would work perfectly here too. I just know that not many like that stronger taste. Scroll down to see how others used whole grains. Thanks for hosting, Cali! Cook the potato until soft. Reserve the cooking water and mash the potato until smooth. You will need 7.25 oz for the recipe. In a large bowl, beat the mash potato, eggs, oil, and sugar. Add the flour, yeast, and water. Knead for about a minute just to get the ingredients mixed together. Cover and let rest for 20 minutes. After 20 minutes, add salt and knead until smooth. This could take up to 10 minutes. If the dough seems dry, add water by the teaspoon. It may look a bit sticky but try not to additional flour unless it is actually sticking to your hands. During the kneading process, it will eventually pull away from the sides of the bowl but still stick to the bottom. 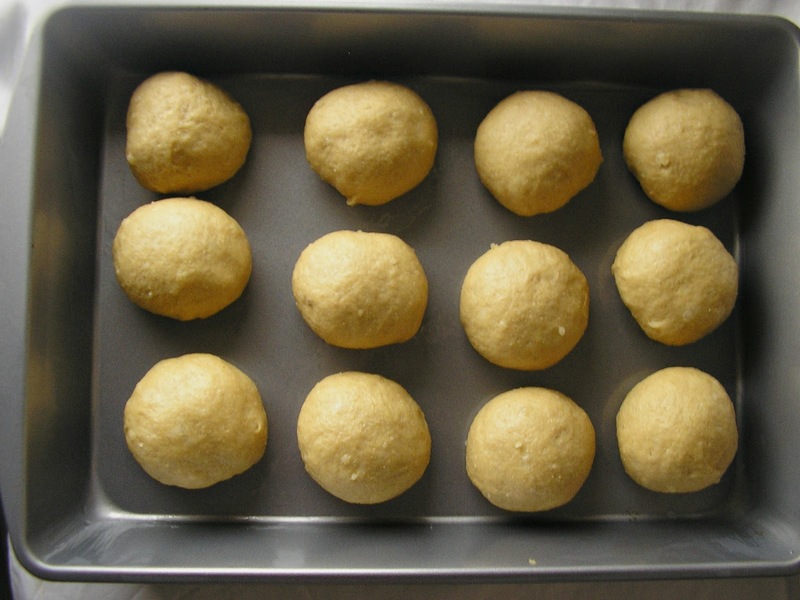 When the dough is smooth, form into a ball and place in a greased bowl to rise until doubled. It could take about an hour or more. It depends on the temperature of your room. Preheat oven to 350 F. Grease a 9" x 13" and a 9" round baking pan. Divide the dough into 20 equal pieces that are approximately 2 ounces each. Form each into a tight ball and place an inch apart in the prepared baking pans. Cover and let rise until doubled and puffy. Bake 20 - 25 minutes until golden. Brush with melted butter, if desired. Cool slightly in the pans then remove and cool completely on a wire rack. Enjoy warm. Typically, a whole wheat recipe will use more water than one with all purpose flour. The recommendation from King Arthur is an additional 2 teaspoons of water per cup of whole wheat flour. I didn't do that here because I made these rolls on a very rainy day and rainy days usually means my bread dough is more sticky than normal. Reserve some additional potato water to add to your dough just in case you need it. This dough looks sticky but it really isn't. Pinch off a piece. If it forms a ball that isn't sticking to your hands, you're fine. These are really delicious. Make them!. #BreadBakers is a group of bread loving bakers who get together once per month to bake bread with a common ingredient or theme.You can see all of our lovely bread by following our Pinterest board. 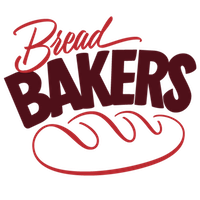 Links are also updated after the event on the #BreadBakers homepage.